It is well established that successful digital oilfield deployment projects require careful attention to ‘People’, ‘Process’ and ‘Technology’. We are very good at recommending technology solutions and after many years of operational experience in the oil and gas industry we can extend our expertise to recommend optimum workflows. But just how good are we all at managing the people transition? Maybe a few interviews with the stakeholders backed up with a couple of workshops will address the concerns? Sociotechnical System. (Courtesy of Baker Hughes and Redline Communications) If we are honest with ourselves, we know very well that this approach is woefully inadequate. If the operations staff, be it in drilling or production, do not buy into the digital oilfield workflows, then a very well designed Realtime Operating Center (RTOC) may become little more than a glorified meeting room. As for business value, this falls well below predictions and the overall digital oilfield project can unfortunately take on the personality of a very expensive failure. So why have we been less successful at transitioning our subject experts in oil and gas when many other industries have accomplished this very effectively? Take the automotive industry, for example. The days of the hand-made car have disappeared in all but the most expensive models. Robotics, just-in-time manufacturing and integrated operations have become the normal way of doing business. The difference is that economic pressures have forced the automotive industry to make the transition – the manufacturer can only make a profit on a standard production car using highly automated assembly processes. The margins in oil and gas have historically been far more comfortable and many operators have not seen an urgency to transform their operations into digital oilfield operations. However, with the current situation of very low oil prices, the economic drivers are suddenly very different. 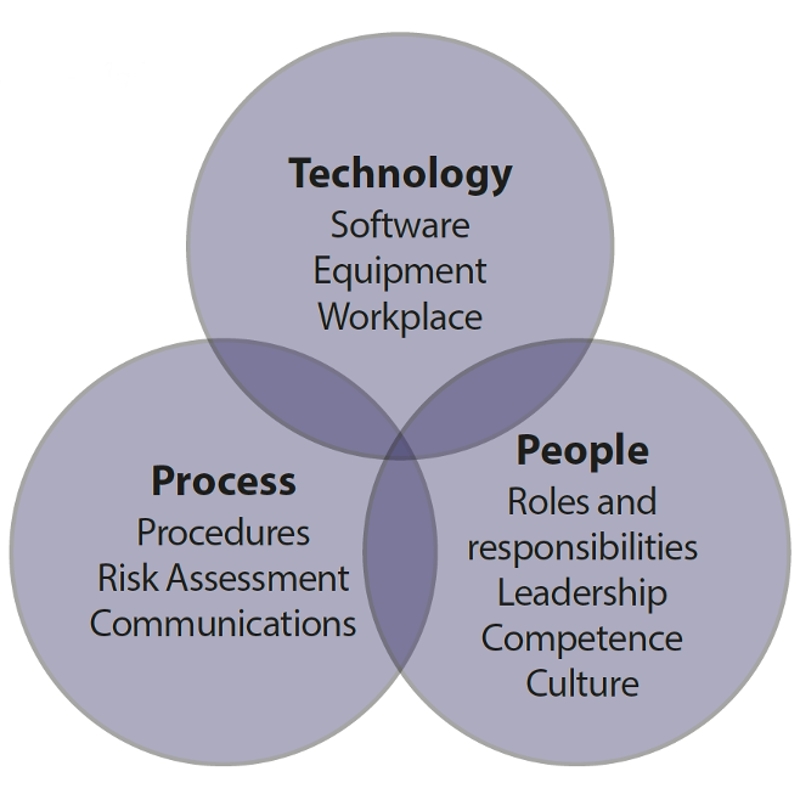 People transitioning from field to remote operations tend to go through three distinct phases. (Courtesy of Baker Hughes and Redline Communications) Let us take, as an example, an experienced field operator who we are asking to relocate from operating onsite to remote working in an RTOC. This is a major people transition. Site working is, by its nature, a very collaborative process. Information exchange is mandated by the site work procedures but is supplemented by informal exchanges during relaxation breaks, meals and ad hoc meetings. The remote worker cannot participate easily in these less formal interactions and can, as a result, feel much less engaged with the drilling or production operations. A standard people transition curve is shown in the diagram on the right. It is characterized by three main stages: Stage 1. Shock and denial – due to concerns about the personal future and doubt that change is really necessary. Stage 2. Anger and depression – this is an emotional response to the change by holding individuals accountable and starting to accept the inevitability. Stage 3. Acceptance and integration – the individual is now going through full acceptance of the change and looking to make the best of it for what will hopefully be a positive future. 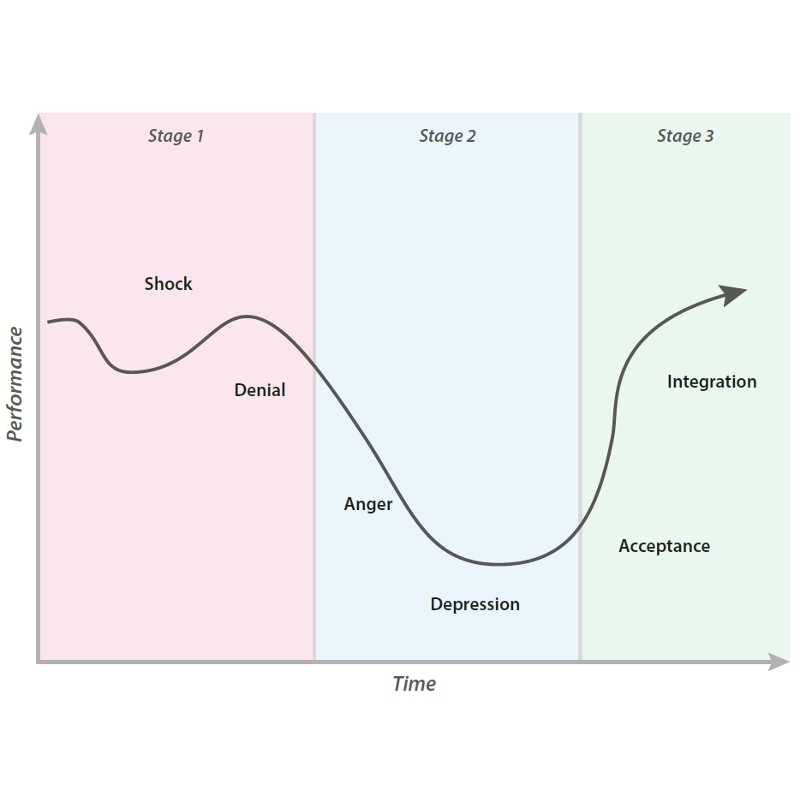 The goal of an effective people transition process should be to minimize rather than eliminate the time duration of Stages 1 and 2 and to encourage the positive behaviors in Stage 3. When there is a change in an organization there is always an impact on people which requires them to make a transition. There are many scenarios which have such an impact: for example, movement of roles from offshore to onshore, a change in equipment used to perform a process, or the introduction of new capabilities. Our experience of supporting oil and gas organizations has identified a number of key considerations to support successful transition of staff. Whilst there are many recorded people-transition approaches documented in literature, each variation is typically built around a framework of similar topics. The framework approach works well in practice as it allows a degree of tailoring and personalization to meet the nuances and cultures of different organizations. There are six key elements that need to be addressed for a successful transition. Baseline Capture: Assessing, recording and capturing the way tasks are currently carried out. Often the way tasks are achieved in reality can vary from documented procedures and processes. It is essential to understand the ‘true’ baseline in order to properly assess the impact of the changes on people. Organization Design: Developing, understanding and capturing what the organization looks like in the future. The change may require additional staff positions to be created, a modified organizational structure or may need to combine additional functions into existing roles. Outlining details early on in the transition process is essential to ensure transparency. Leader Engagement: Most organizational changes fail as a consequence of leadership not buying in and leading the change. Engaging leadership early and involving them in defining future design helps to support buy-in and uptake of the changes. This activity creates a sense of ownership for the change and is key to ensuring staff embrace the change rather than push back against it. Organizational Transition Assessment: Assessment of the ‘new’ world versus the ‘old’ world to address gaps that need to be bridged in staff knowledge and skills. This activity is used to identify where modifications to competence management, training and recruitment systems are necessary, to assess the level of manpower change and analyze any new risks where poor human performance can have a significant impact on the business. Staff Engagement: Communication with all staff at regular intervals throughout the transition. The key focus should not only be the high level vision and goals of the change but also on the personal impact for each individual. Competence Assurance: Delivery of necessary modifications to the competence management and training systems to move staff from their existing roles to their future roles. Addressing this aspect at the right time will ensure people are ready for the changes from day one of the new operation. People transition is very complex as the management of these key aspects involves a much wider group than the immediate project team. It is usually necessary to involve senior management, operations, human resources and possibly even legal teams. The transition team needs to be an integrated function involving people from these business departments throughout the process. 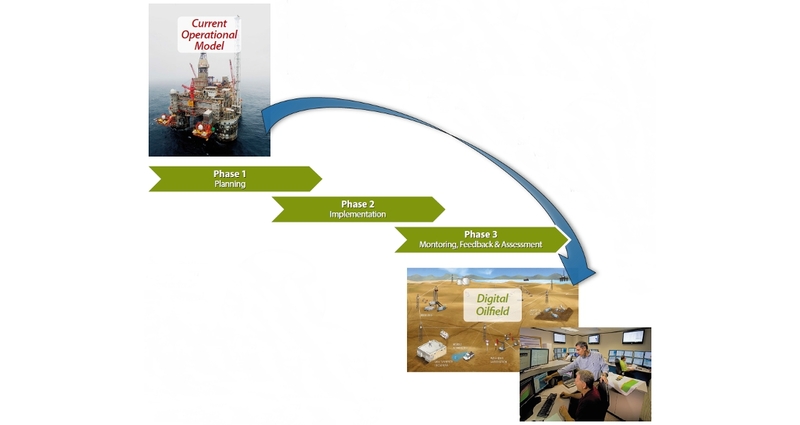 The transition, in digital oilfield terms, is about managing the people factors as an organization moves from its current operational model to an optimized digital oilfield model. From our experience, this requires three distinct project phases, as shown in the diagram below. The first stage is planning. This must address fundamental concerns in an organization about the transition. Typically, these will include: finding out what critical areas of its business will be impacted by the transition; what the risks are and how to manage them; how many people and what range of skills will be needed in the new organization; how well existing staff will be able to cope with the transition, and if not, how to help them; and how to inform staff of the changes, motivate them and take them along for the journey. The second stage is implementation. This is the execution of the transition, during which time the company should undertake training and competence management to ensure that staff can fulfill their roles in the new organization. A consultation process should be actioned to manage staff mobility to new roles or work processes (including those leaving the organization, if appropriate), and there must be regular communications to inform staff about what is happening. The third stage is monitoring, feedback and improvement. This assumes that the transition is complete and provides an on-going health check to address concerns, make any adjustments and ensure that the new operating model is delivering the expected business value. An organization that has made a successful digital oilfield people transition feels like a great place to work. Staff are motivated, much of the bureaucracy is eliminated and the efficiency of the organization has improved significantly. There is much greater awareness of drilling and production operations and individuals feel much more empowered to contribute to the success of the organization. There is also a much closer dialog between the oil company personnel and third party contractors who are supporting the operations. In an ideal situation they may be completely indistinguishable. The old methods of blame and financial claims should be replaced by a spirit of collaboration and the promotion of a win-win culture. The real test of this comes at a time of lower revenues, as we are seeing currently. Is the immediate response to shed all the personnel to protect the short term balance sheet or to take a longer term view, retain the workforce and strive to improve efficiency and build opportunities for when the inevitable price recovery occurs? History has shown that it is those companies who ride out the storm and demonstrate loyalty to their staff and contractors who are best positioned to capitalize once recovery occurs. If key personnel have been lost from an organization it can take a significant amount of time to rebuild capability. Geologix Systems Integration delivers an independent advisory service covering all aspects of the digital oilfield. We see people transition as a very critical component of a successful digital oilfield implementation. For each of the three transition management phases we have detailed work processes that have been developed based on significant experience with oil and gas clients. Unfortunately there are case examples of operators that have spent tens of millions of dollars implementing digital oilfield technology solutions who have failed to realize expected investment returns because the people transition was not addressed in a professional manner. To address the upcoming ‘Great Crew Change’ industry organisations are putting increasing effort into ensuring new entrants into the O&G business get access to information and training.